With a culinary history that dates back to the Ottoman empire, Turkish cuisine is not an easy one to summarise. With its endless variety of dishes – meat, seafood, spices and fresh vegetables – bursting with flavour and textures, its blend of Asia and Europe with influence from the Middle East means you’ll never have a bad meal while visiting Turkey. This rich, sweet dessert pastry needs no introduction. Made with layers of paper-thin filo pastry that’s filled with chopped nuts and sweetened with syrup and honey, one piece is not enough. This baked-filled pastry traces its roots to Anatolia but is also eaten in the Balkans and across Eastern Europe. Made of crusty thin filo with white feta cheese layer with spices, there’s both sweet and savoury versions but the ground meat one is hard to pass up. For the beer drinker, Efes, a European-style pilsner brewed by Andalou Efes Brewery is a brew you’ll find readily available and best enjoyed ice cold. For hearty meat eaters, kebabs will be a staple food while in Turkey. Beyond the doner kebab (lamb, chicken, beef roasted on a vertical spit), there’s an endless number of variations. The most common versions are adana kebab (spice ground beef grilled on a skewer), urfa kebab (similar to the adana but without the spice), shish kebab (with meat and vegetables), ciger kebab (made with lamb liver and herbs) and iskender (essentially a doner kebab but served with melted butter over bread and a side of yoghurt). 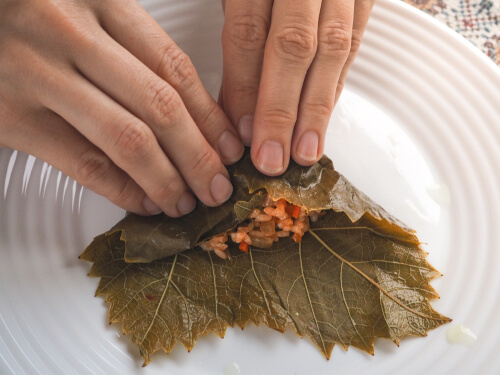 Served as both a hot and cold mezze, the name directly translates as ‘stuffed’ and this seemingly simple dish of grape leaves stuffed with meat or vegetables with rice and spices is often used by locals as an indicator of one’s cooking skills. No trip to Turkey is complete without a few tastings of kofte, ground beef or lamb rolled into balls or shaped into patties which are served stewed in a sandwich or a salad, or for a lighter dish, with creamy yoghurt. A popular street food sold in wheeled carts or in small eateries, lamb intestines are wrapped in a sweet bread, skewered and grilled over a charcoal fire before salt and oregano is sprinkled on top. Chilli flakes or cumin add additional flavour. A popular Turkish snack of roasted chickpeas sometimes seasoned with salt, hot spices, dried cloves, or candy coated, keep your eye out for street sellers peddling these delicious moorish snacks. Commonly served as a cold appetiser, these tasty vegetarian meatballs are made with red lentils, bulgur wheat, onion and red pepper paste, parsley and cumin, and when done well will make you forget about having the meat version. This Turkish style of barbecue reflects the culture’s love for social interaction. Also referred to as mangal, the name translates as fireside and ocakbasi restaurants are typically characterised by a hooded charcoal barbecue in the centre of the restaurant where diners can watch and interact with the chef as he prepares meals. This Turkish aubergine dip is a popular mezze and is as simple as it gets – grilled aubergines, olive oil, lemon juice and salt, spiced with fresh coriander, ground cumin, garlic or cayenne. Sometimes, it’s mixed with some yoghurt for a creamier texture. This molasses-like syrup is made by locals after the grape harvest. Ripe fruit is collected, stomped on, strained and cooked for hours to obtain a sweet, sticky liquid that’s used as a sweetener or mixed with tahini for breakfast. 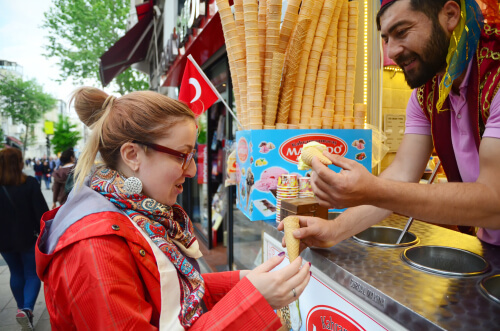 This creamy, chewy Turkish ice cream – made with milk, sugar, mastic and powder from the tubers of wild orchids – is as fun to eat as it is to watch. Look for the guy wearing a fez, fooling about with customers as he tricks them into reaching for the cone of gooey ice cream (its unusual consistency is thanks to the addition of mastic). Think of this as a Turkish version of pizza. Here, dough is left to rise for 12 hours before it’s baked in a wood-fired oven. Instead of a round pie, it’s shaped in a long oval and cut into rectangular pieces for serving. There’s a wide variety to sample, from Karisik (vegetables and ground beef), sucuk (Turkish pepperoni), kiymah (ground beef with tomato, onion and green pepper) but if you only have one chance, opt for the kiymali (lamb, onion and black pepper). Freshly-squeezed nar (pomegranate juice) is readily available all over the country, just look for the sellers on street corners who’ll be more than happy to serve you a cool glass. An unsweetened, often anise-flavoured, alcoholic drink that’s popular in Turkey, you’ll recognise it from its cloudy appearance (when mixed with water) and liquorice flavour. This dried red spice is a condiment you’ll find popping up in a number of Turkish dishes. Made from the dried and powdered fruit of a tree that grows in the Anatolian peninsula, it lends food a slight acidity and tanginess, and is used in hummus or sprinkled on grilled meats, seafood and fish, kebabs and salads. 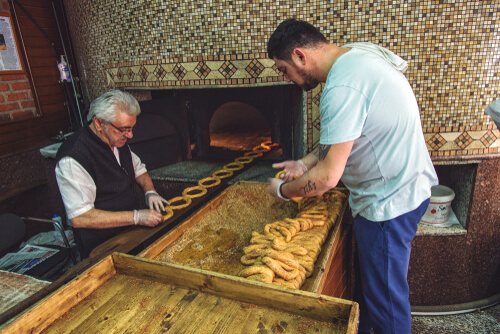 While in Cappadocia, look out for Sultan honey bread which is only served in one place: Lale Pide in Avanos. The hunt will be worth it, the dough covered with raw egg, honey and walnuts before its baked, is utterly delicious. A Cappadocia specialty, part of the attraction of this Anatolian dish lies in its presentation. Served in a sealed clay pot or a jug that’s broken open by the waiter before serving, this dish of meat and vegetables – popular ingredients include beef, lamb, chicken, root vegetables, celery, onions and garlic – is cooked for a minimum of four hours in its own juices so the result is a full flavoured stew of deliciousness. Not to be mistaken for a bagel, the Turkish version is a lot thinner and has a bigger hole in the middle and comes covered most commonly in sesame seeds. Traditionally eaten at breakfast or as a snack, you’ll see these pillowy circular breads being sold everywhere by street vendors, especially around the Blue Mosque and Sultanahmet district. Prepared using very finely ground coffee beans, water and sugar. The Turkish people prepare their coffee in a special pot called the cezve to achieve the delicious crema. Ask for it unsweetened (sade kahve), with a little sugar (orta sekerli) or sweet (tatli). A cup of tea is commonly offered as a form of hospitality and the locals opt for a black rize tea, produced in the Southern Black Sea coast. If a fruit flavour is preferred, apple or rose is easily found. While in Cappadocia, make time to try the wine (also known as sarap) grown there. In particular look for the family-owned Turasan winery which has been in operation since 1943 and known for producing the emir, a white grape of Cappadocia.